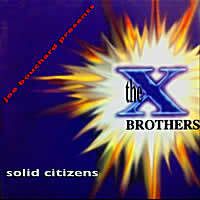 The X Brothers was the first band Joe joined after leaving Blue Oyster Cult. Originally, the plan was for Albert Bouchard to be in the band but he dropped out before a gig was played. Joe, Billy and Andy Hilfiger and Jimmy Cacala set up as a four-piece in 1988 and played gigs on and off right through until around 1992, often supporting themselves under the guise of their Doors-tribute band, Crystal Ship. Eventually the project fizzled out around 1992. 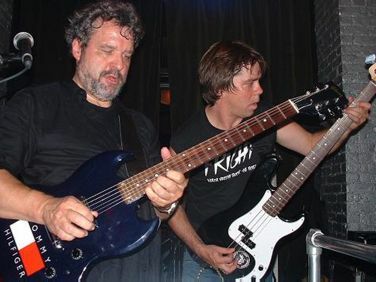 After some time off, Joe and the band got back into it after the Metallica/Astronomy deal and have been playing the occasional gig ever since. Currently they comprise Joe on vocals/guitar and keys, Andy Hilfiger on bass/vocals, Jimmy Cacala on drums/vocals, Rob Cannavino on guitar/vocals and Bobby+Hilfiger on percussion/vocals. The known Cult/X Brothers giglist is here, the known setlists here and reviews here. If you can add any information to any of these pages, please let me know. Have you ever seen an X Brothers/Cult Brothers show? If so, please send me a review - your contributions are very welcome so please get in . 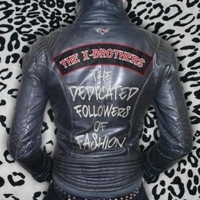 The latest X Brothers CD - The Dedicated Followers of Fashion - is available at last from CDBaby. The X Brothers just spent two solid days recording our new album at Big Time Studio in Interlaken NY. We did 13 tracks for the CD that will be out this summer ("Dedicated Followers of Rock n Roll" is the working title). The songs are all covers, some famous, some obscure, that to relate to the theme of clothing and rock and roll. Since Andy's got a new line of duds, called Andrew Charles, I thought it was a no brainer to do a fun set of tunes that relate to what's been part of our routine for years. It's a party record. Having a party? Want great music? Just put it on the old Victrola and get down! You will hear it all soon. For the third year running, the X Brothers have been part of the Skynyrd January Simple Man cruise - it's a dirty job, but someone's got to do it!! The X Brothers had the biggest crowds this year. The final show was packed to the rafters. We played three shows. Thursday night, Friday night and Sunday night. Each set was about an hour. MIchael Cartellone and Robert Kearns from Skynyrd sat in on the Sunday night show. As for set lists? Hmmm... can't remember. I'll write out a set but then make changes midstream. We tried to make each show a little different since many people came to see us for all three shows. Incidentally, we started working on a new CD, all cover tunes, some obvious, some obscure. We've got 10 demos so far. Hope to have it out in Sept.